The rains are here. And so are long weekends with various festivities arising in the near future. For those of us who need a break from the crazy city life, now seems the best time to pack up and go to some place serene. For Mumbaikars like me, we find it best to run away to hill stations like Mahabaleshwar, Lonavala, Igatpuri, Panchgini and Matheran. Road trips to such places are the cheapest and they give the best unforgettable memories. But with petrol prices soaring, we wonder whether it’s worth the money and time. Planning your trip is the starting point to saving. Decide on places that you wish to explore and look out for all options on lodging. Look for hotels that meet your requirements and pick out the cheapest. Reserving your preferred hotel in advance will cut down the cost that you may have to incur if you decide on a hotel last minute and end up in one which is more expensive. 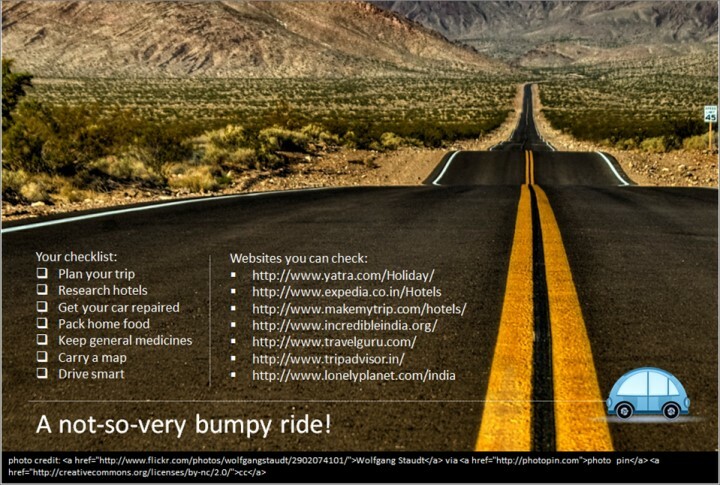 Use travel websites to get recommendations on the best hotels, eateries and activities. You may also want to decide on not renting a car. It’s cheaper to take your own car. If necessary, get it repaired to keep your road trip a smooth ride. Rainy seasons are cool and once you start ascending a hilly area, the temperatures outside are bound to get lower. Take advantage of this and avoid using the air conditioning. Ensuring that the tires are inflated to the right pressure will get a far better mileage. If the travel time is a lot, ask somebody else to drive while you rest in the back seat instead of having to stop over for the night. Packing your own food from home is the best part about taking a road trip. Splurging on fast foods and snacks from roadside outlets not only turn out expensive but can come at the cost of your health. You don’t want to spoil your adventurous weekend just because you fell sick! Travelling with your own food will also shorten your travel time and save you money. Travel sickness is common amongst many. If you are amongst them, be prepared with medicines. Getting lost is frustrating, time consuming and wastage of petrol. And if the scenario worsens, you will be spending extra on food and lodging. Always study your route plan in advance. Of course this won’t keep you from getting lost, so keep a map of the area handy. If you get confused on the way, stop and ask the locals for help. 0 responses on "A not-so-very bumpy ride!"